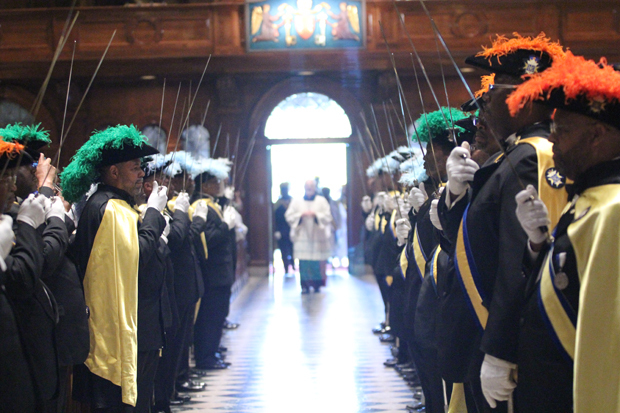 The Knights of Peter Claver line the main aisle of the Cathedral as the entrance procession comes into the church at the start of Mass. 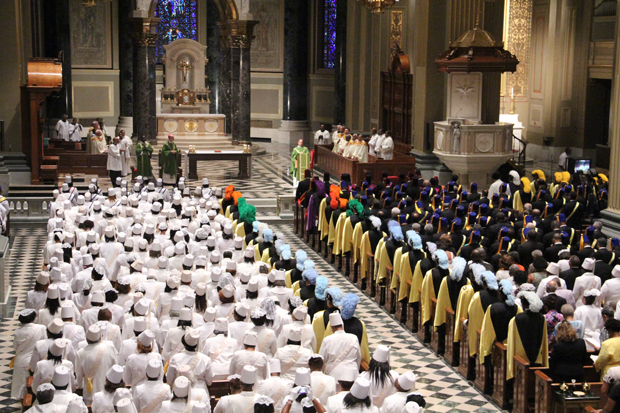 It was possibly the most elegant gathering of Black Catholics in the history of the Cathedral Basilica of SS. Peter and Paul. 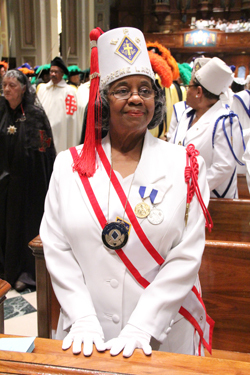 Almost 1,000 Knights and Ladies (especially the Ladies) of the Knights of Peter Claver filled the grand old cathedral on July 21 for the opening Mass of Thanksgiving as part of their annual convention, and first ever in the Archdiocese of Philadelphia. Most other events took place at the Philadelphia Marriott Hotel. “The entire Church of Philadelphia rejoices with you as you come for your assembly in our city,” said Bishop Timothy C. Senior, the principal celebrant of the Mass, representing Archbishop Chaput, who was on his way to Rio de Janeiro for World Youth Day. “We are blessed to have you for this 98th Annual Convention and Supreme Assembly of the Knights and Ladies of St. Peter Claver. Your order is a great blessing to our parishes and churches; our schools and other ministries. Joining Bishop Senior and other clergy on the altar was Bishop Shelton Joseph Fabre, auxiliary bishop of New Orleans and Msgr. William Leonard Norvell, superior general of the St. Joseph’s Society of the Sacred Heart (Josephite Fathers). The Knights of Peter Claver was founded in 1909 in Mobile, Alabama at the urging of the Josephite Fathers who ministered almost entirely to the African American community. In structure they mirrored the Knights of Columbus, which at the time had very few African American members and none in the strictly segregated Deep South. “What a joy it is to be here, to renew old friendships and make new friendships and to share with one another our desire to serve the Lord and to serve His Church,” said Supreme Knight Carlos Blackmon. The Ladies Auxiliary was organized in 1922. While they are still very much part of the organization, today they vastly outnumber the men. The most striking feature of the cathedral Mass was the presence of approximately 600 Ladies in the regalia of their order — white skirted suit, white fez, white pumps, gloves, purses and button earrings. All, except those in the procession, were seated a full hour before the liturgy began. The Knights and Ladies as a whole were definitely committed Catholics. Overall, the Knights are not a large organization, perhaps 17,000 members, something for which they compensate by dedication. Supreme Lady Vertelle A. Kenion. Although the orders were founded in Mobile their headquarters is now in New Orleans because it has a heavier concentration of Black Catholics. “We are strong there and in Atlanta, and also in Los Angeles and Houston,” Jones said. Although not many members are in the North, he believes Philadelphia was a good choice because the cathedral was large enough for a group Mass. “When there is a cathedral we try to use it, and it was full and the Mass was streamed live,” he said. Locally, there are about 10 councils or courts in the Philadelphia area, according to Deacon Bill Bradley, director of the Archdiocese of Philadelphia’s Office for Black Catholics and himself a Knight. Lou Baldwin is a freelance writer in Philadelphia. What a feeling I experienced to be a part of this great organization and there with my brothers and sisters celebrating Mass together. Proud to have it in our city.